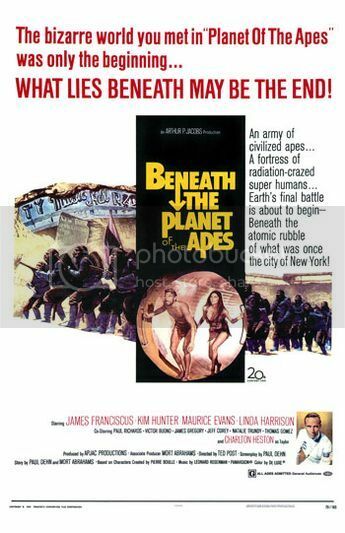 Beneath the Planet of the Apes is slow going at first, but it picks up by the end, eventually letting its story careen away into madness and chaos and Charlton Heston once again on his knees, shouting "Oh, the humanity!" Which is to say: it gets a lot better. We return to the titular planet only moments after the original left off: "Damn you all to hell!" Taylor (Charlton Heston) cries, on his knees, beating at the sandy beach. Not long later, Taylor and his mute ladyfriend, Nova (Linda Harrison), encounter all manner of strange things in the so-called "Forbidden Zone", a desert wasteland where none dare go. Taylor and Nova dare, and are met with random walls of fire, sudden spurts of pesky lightning, and Land Before Time-esque splits in the earth. When they come upon a rocky outcropping, Taylor walks into it and vanishes. Meanwhile, astronaut Brent (a tanned, macho James Franciscus) has crash-landed on the Planet in search of the missing Taylor. After coming upon a distressed Nova - okay, admittedly she's always distressed - he hops on Taylor's horse and goes through much of the same terrain (pun intended) we covered in the original: the stumbling upon ape civilization (yay Cornelius! yay Zera! yay sympathetic chimpanzees! ), the numerous (and now dull) scenes of flight and capture, the paper-thin allegory to a segregationist, racist society of the 1960s on the verge of social revolution, with gorillas standing in for military hawks/goons, orangutans as the Christian Right and chimpanzees as the intelligentsia. Things really pick up when Brent eventually finds his way to the title: beneath the Planet. Here, we find remnants of a post-nuclear Manhattan, complete with a crumbling (but intact) subway system and a sometimes-hilarious, sometimes-creepy cult of humans who worship the last, remaining (?) atomic bomb. The plot now starts coming fast and thick, with a conclusion that is as jarring as it is pulpy and paranoid. This sequel to the 1968 hit is a much paler copy of the original, though it does have its moments. Cocooned in the flash and spectacle of a Saturday sci-fi matinee (George Lucas must be proud! ), there were also some very dark scenes of terror and doomsday paranoia. These punctuating bass notes were unexpected, powerful and not altogether welcome to us (especially since we were eating at the time): the ape army coming upon a mirage of their deity on fire, weeping blood, surrounded by apes crucified upside down. The sweaty, desperate, humiliating Spartacus-style fight between mind-controlled Taylor and Brent, for the amusement of the freaky human cult. The freaky human cult, and their freaky Anglican-style service from hell. And the masks! Oh God, the masks!